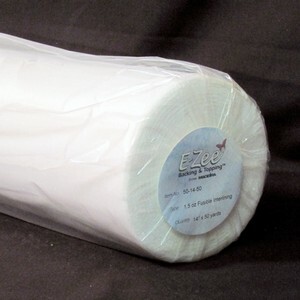 E-Zee Comfort Just Right 1.3 oz.is a smooth, soft cover-all that is fused to the back side of finished embroidery with an iron or heat press. It produces a finished look and feel, and is perfect for children and infant wear and for anyone with sensitive skin. Use on all of your embroidery to add a unique finished look and feel that will put your business above the rest! The heat-activated side of E-Zee Comfort Just Right 1.3 oz. has a rough feel to it. After embroidering your design, turn the garment inside out to expose the back side. Lay a piece of E-Zee Comfort Just Right over the back side of the design with the rough side down. Trace a trim line about ½” to ¾” larger than the finished embroidery. Be sure to round the corners and cut out. Place the piece over the design evenly with the rough side of E-Zee Comfort Just Right facing down. Fuse on by applying heat at 250° to 270° for approximately 10 to 20 seconds.